In this article we will try to understand a few circuit ideas that can provide low voltage and over voltage protection to connected electrical assets. Though these circuits won’t be able to stabilize the input voltage, even so may prove very effective in providing total safety to your precious electrical home appliances against dangerous input voltages. The first design of a low voltage indicator circuit may be used to indicate the presence of dangerous low voltage conditions. 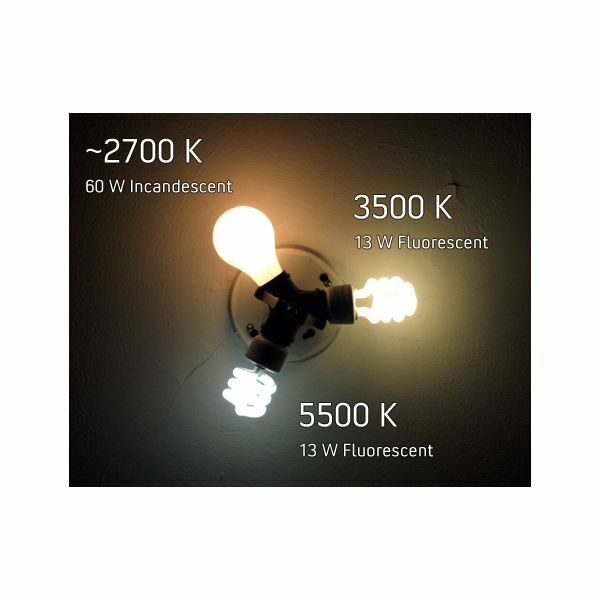 A low voltage may appear to be something that is lower in magnitude and power, but that is what makes it more lethal. For example a refrigerator working at 230 volts AC mains will never “like” voltages below 190, since in such cases its compressor due to the lack of sufficient voltage, will try to compensate by drawing heavy currents and may get damaged if the situation persists. The same is true for other types of AC operated motors. Also in vehicles, for example a car, if the battery voltage falls below 9 volts, it may be quite harmful for the life of the battery itself and moreover the vehicle will just not start at that voltage. The second circuit is similar but opposite in response. It is basically a high voltage detector circuit and when attached to an electrical system will warn you of detrimental high voltages. These voltages are perhaps more risky, as under such conditions the equipment may not get enough time to withstand the jolt and may be instantly burnt or damaged. We will also learn how these two circuits can be joined into one and used to sense both the levels of “bad” voltages and CUT the supply under such circumstances to save guard your precious electrical gadgets. 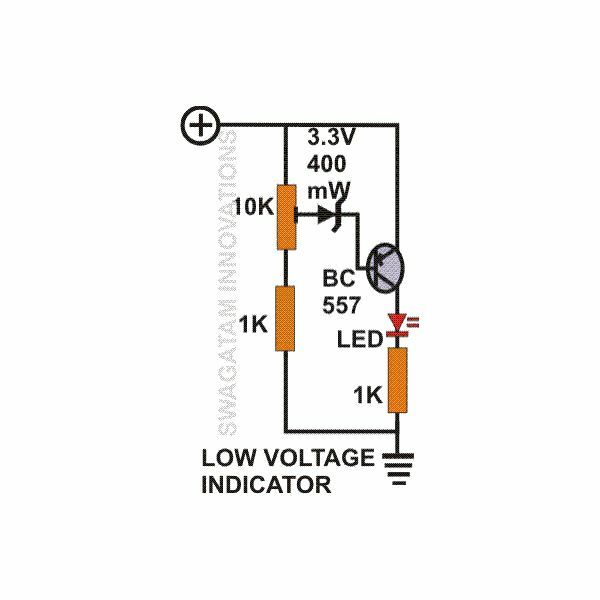 Low voltage indicator circuit: Referring to the figure we can see that the circuit utilizes mainly a single PNP transistor and a zener diode to sense a low voltage. As per the setting of VR1, the moment the input voltage falls below the predetermined reference, the transistor conducts and switches ON the LED to show a low voltage condition. 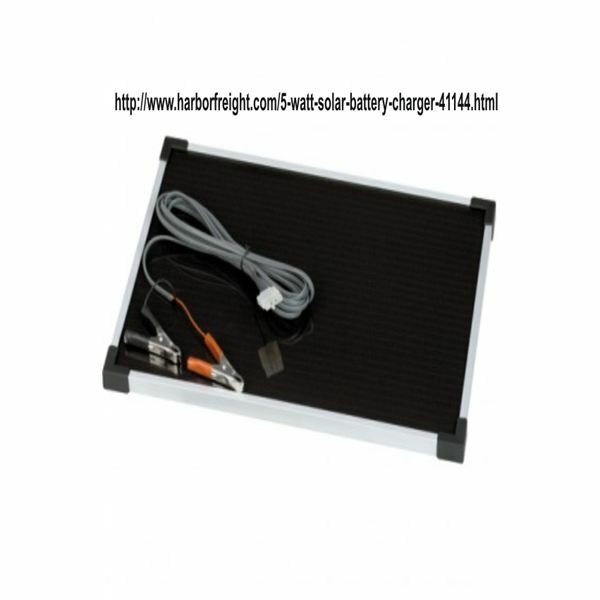 The circuit may be used in vehicles operating on 12 volt batteries, to display the “health” of the battery. Here VR1 should be adjusted such that the LED begins to glow at around 10.5 battery voltage, indicating that it needs a proper charging. Preferably a flashing type of LED may be used rather than a continuous one to attract immediate attention of the driver. It can be accommodated on the vehicle dashboard itself. High voltage indicator circuit: Another simple configuration shown in the figure is of a high voltage detector circuit. Here instead of a PNP, a NPN transistor is used to detect high voltages. If the input voltage rises above the set level of VR1, the transistor will conduct to put ON an alarm or an LED. This circuit alone won’t be practically useful in any application, as during high voltages there is always a chance of the equipment in the line of fire getting damaged instantly, just an indication wont help. So it becomes important to arm the circuit with an additional cut-OFF facility, so that it can switch OFF the supply voltage in such dangerous scenarios and provide an impeccable over voltage protection to the connected unit. 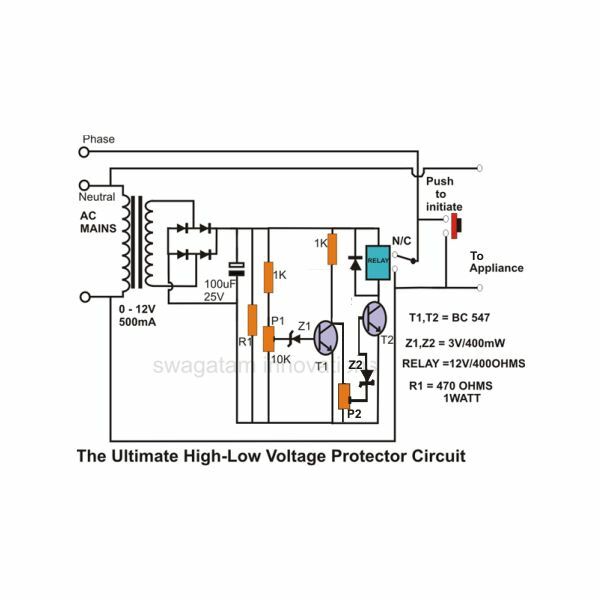 High voltage-low voltage cut-OFF circuit: As shown in the circuit diagram, a couple of transistor stages are integrated together along with an output relay, which is able to perform the function of super safe voltage guard equipment. As explained above the transistors sense the presence of the dangerous voltage levels respectively and activate the relay to protect the connected appliance from drastic situations. 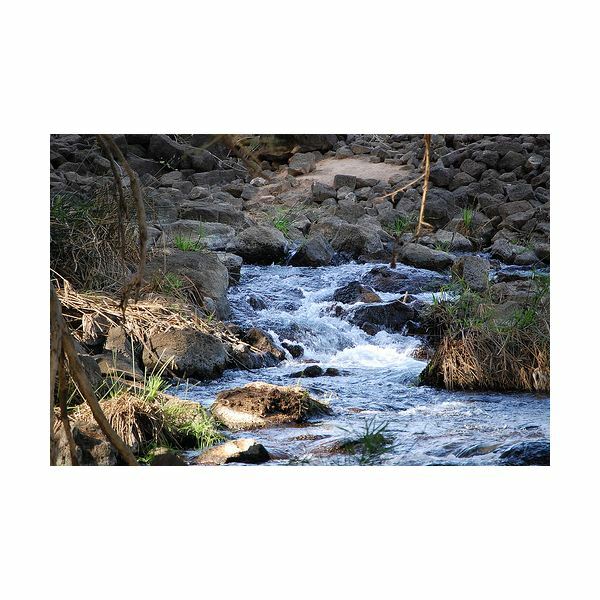 The cut OFF supply will be immediately restored back once the voltage returns to a safe level. The circuit may be used as a home protection system and installed inside the existing main switch board with the relay contacts connected in series with the mains supply line. 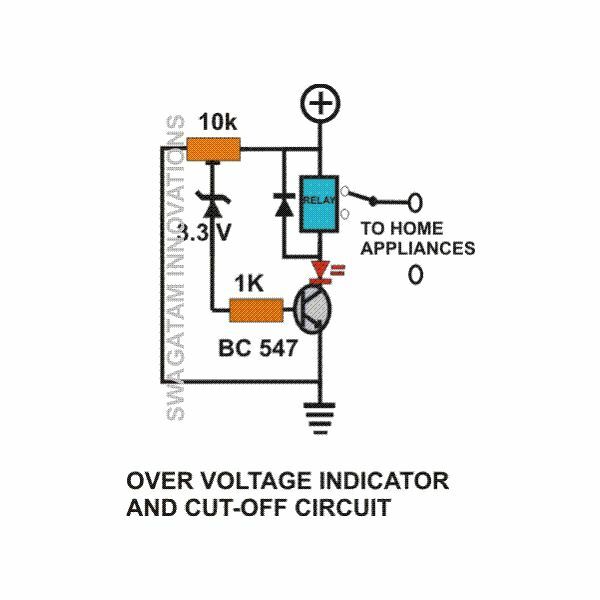 Thus this circuit will not only cut OFF during low voltages but also will provide a total over voltage protection to the entire house or premises. 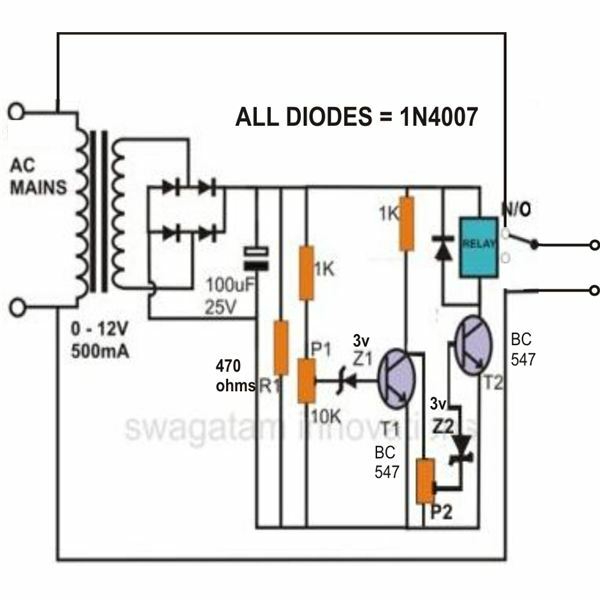 This circuit is a modified version of the previous one and is able to switch of the load and itself in case the input voltage reaches dangerous levels. 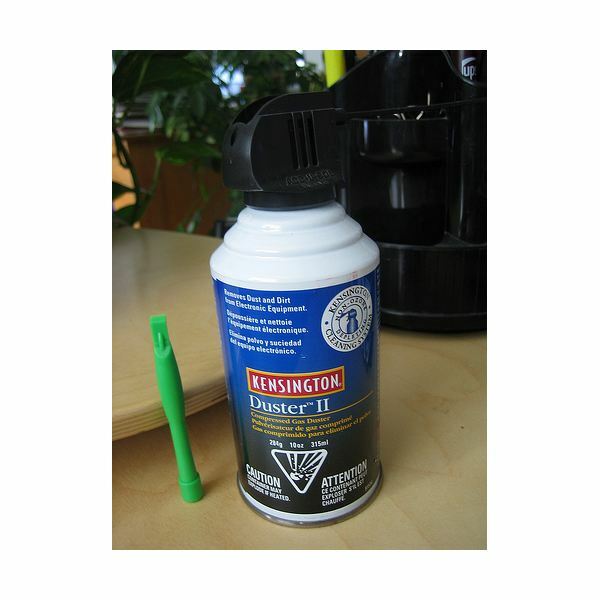 It can thus provide an ultimate protection to any gadget connected at its output. After the required settings of the presets are done as explained above, pressing the push button will initiate the circuit by connecting the AC supply to the transformer. On receiving the supply voltage the circuit will operate by energizing T2 and the relay. The relay contacts will get latched so that the entire circuit now receives the supply voltage through its N/O contacts and the push button may be simply released. As long as the supply voltage is within the normal range, the circuit remains latched and the output appliance is safely powered. Now, if the voltage increases to an undesirable extent, T1 will conduct, bringing the base voltage of T2 to ground and thus deactivating T2 and the relay. Once the relay contacts are dislodged, the supply to the appliance as well as the whole system is broken. The circuit will remain unlatched until two conditions are met viz. the push button is pressed and the voltage is restored to its normal position. The same will happen during the unsafe low voltages. QUIZ: Can anybody tell us why R1 has been included in the circuit?